This trip sells out every year and is one of the MUST DO experiences in Portland! 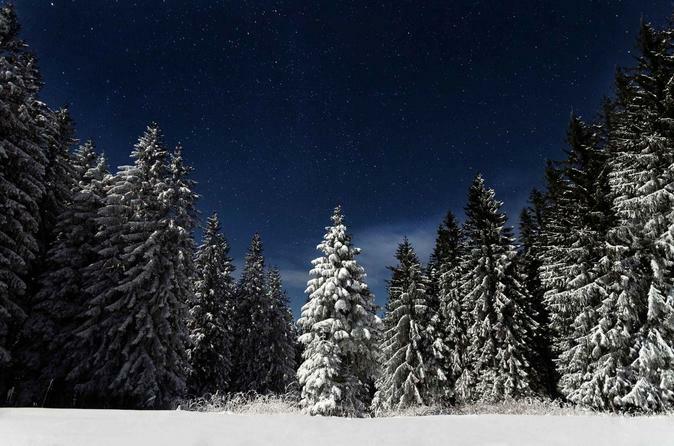 Snowshoeing in the moonlight is a magical experience, perfect for date night, girl’s night out, office Christmas parties, or just a fun trip with family and friends! Our guides will show you the way to some spectacular views of Mt Hood and the surrounding National Forest. After about an hour, we’ll stop for hot drinks/snacks and some star gazing and story telling. Take a moment to sit and take in the stillness of the remote mountain environment. This is a trip designed for anyone, young or old, any fitness level! This trip departs at 6pm from our Troutdale office located at 906 NW Corporate Dr, Troutdale, OR 97060. Plenty of parking is available onsite. We will load into our winterized van and drive an hour out to the trailhead, arriving just at sunset. After a short instruction period we will snowshoe on a moderately graded trail for approximately an hour before breaking for snacks and hot drinks. After snowshoeing back to the trailhead, we return to our office, arriving around 11:30pm. We will provide snowshoes, trekking poles, headlamps, light snacks, hot drinks, a guide, and transportation. Please dress appropriately for the weather (bring layers and a waterproof jacket), wear sturdy and warm footwear (regular hiking boots are fine), and bring a small backpack with a liter of water.